the clutch is stuck. Any ideas on fixing this problem. at the moment to get it to the dealer. Your clutch has a semi-metallic lining and it is common for them to fuse or rust together when sitting for long periods. Check your owners manual for the clutch 'blocking' procedure under 'extended storage'. I have heard from others that they were able to loosen the stuck clutch by driving the tractor around and putting a load on the clutch. Of course this means you must bypass some safety switches to start the machine in gear or start it in neutral and try to shift into gear without the clutch. Both have their risks. Hopefully someone else will have a better suggestion. I'm wondering if the pedal won't move or if the pedal moves but the clutch doesn't disengage? You hear about tractors that end up with the clutch discs rusted onto the flywheel and pressure plate if stored without blocking the clutch pedal. A month does seem a little soon for this to happen. I haven't thought about how the pedal would work if the disc were rusted. I suppose the pedal would depress but the clutch wouldn't release. The pedal may not depress if there's a problem with the linkage or throw-out bearing. The clutch on some tractors can be accessed by removing a cover on the bell housing. On such tractors, rusted clutch discs are sometimes freed by a little banging on a big screwdriver. I imagine the TC is similar to my Ford, and there is no access to the clutch other than splitting the tractor. 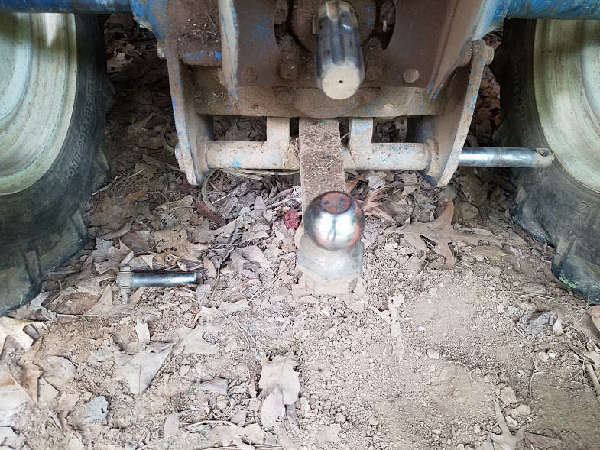 There are all kinds of safety issues, but if the pedal depresses, I'd be tempted to block it down put it in gear, the throttle in kill and then try to pull the tractor--maybe with a bit of a jerk. Many dealers have their own trucks or work with a trucking company. They subsidize the hauling fees so getting you tractor picked up and carried to a dealer may not be as expensive as it sounds. Most dealers also have mobile mechanics, but hourly rates are charged for travel time. Trips back to the shop for special tools or parts that weren't anticipated would make for a killer bill. It's usually cheaper to get a compact to the dealer than the dealer to the compact. There are some tricks to getting a stuck clutch working. Like Tom suggested pulling or pushing the tractor with the clutch pedal depressed. If you can get in to the housing there are penitrating materials that help such as brake cleaning fluids. I have a friend that restores cars as a hobby (Ph.D. in Physics, who figures?) who would have a trick. If you have someone near you like that contact him. My question is why did it happen? How did the water get on the clutch? Gary, if you find some help many old veihcles have this happen as well as many tractors that are shipped across the big waters do to the salt air. If you can get the tractor started in a high gear often by holding the clutch down and jumping on the brakes they will break loose. Parking a tractor on a dirt floor in an enclosure would add to the problem. Since that's the situation I have, I probably should be blocking the clutch pedal more often than I do. We have a 1993 Agco-Allis 5680 that was left sitting for four months and now the clutch won't engage - it starts fine - and we can drive it in first gear - I can't afford to take it to a tractor repair shop to break it in two - any suggestions out there? It was an anniversary present for my husband and I feel terrible that it doesn't work now. My husband can work on things mechanical but it can't get too technical - and we don't own heavy equipment hoists, etc. to repair it. ftcnlc, tell your husband to pump the clutch full up, full down, until just before his leg goes numb from doing it, . It is just hung up, probably surface rust on the shaft so the plate can't slide fully, repeated operation usually cleans it off. There is one other possibility, and I hate to even mention it, but from the description it could also be from a worn clutch lining. When the friction material gets worn down there is too much clearance and not enough pressure on the clutch itself, this causes slipping. Talk to a dealer I'm sure they will gladly tell you how to check the free play. I was able to help a guy with his Kubota L245 much like the way Tom is saying. He put the tractor front end up against a short wall and and was able to break the clutch loose this way. I would use a good bit of caution doing this. I did not see him do it but he told me that it worked and was very happy he did not have to break the tractor in half.